A famous catalog house is the Sears Mitchell that Laura Ingalls Wilder lived in from 1928-1936. Laura Ingalls Wilder's "Rock House" in Mansfield, Missouri. Photo courtesy of the Missouri Division of Tourism. Technically it is not a Sears kit home; however, it was built using plans from Sears. Rose Wilder Lane, Laura's daughter, built the Mitchell for Laura and her husband Almanzo in 1928. Rose had become a successful writer and wanted to give a new house to her parents as a Christmas gift. 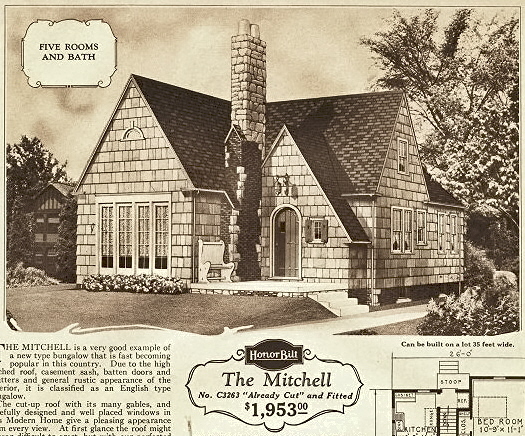 Rose picked out the house from the Sears Modern Homes catalog but had the Mitchell built using local materials, not pre-cut materials delivered from Sears. Rose wanted stones on the exterior and not wood shingles. The Mitchell was customized on the interior as well and it cost over $11,000 to build. The house was built on the 180-acre Wilder property outside Mansfield, Missouri. Rose moved into her parents' old farmhouse and Laura and Almanzo moved into what the family called the "Rock House". Laura, Almanzo, and Nero in front of the Rock House. Photo courtesy of wendymcclure.net. In the Rock House, Laura hand wrote the first four books in the Little House series: Little House in the Big Woods, Little House on the Prairie, On the Banks of Plum Creek, and By the Shores of Silver Lake. 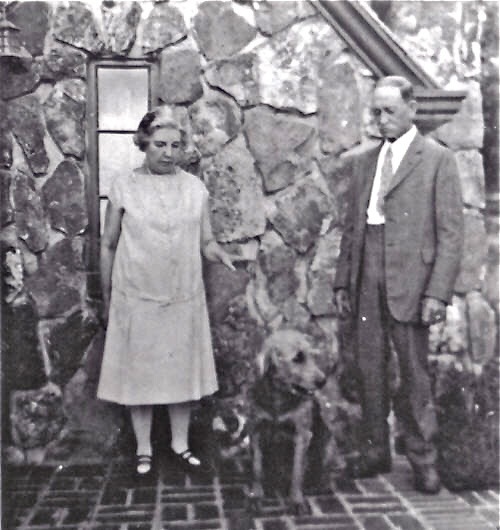 In 1936, Rose moved to Connecticut and the Wilders moved back into the old farmhouse. They told Rose they were homesick. The Wilders sold the Rock House and the adjoining 40 acres to a neighbor. They lived in the farmhouse until their deaths (Laura died in 1957 at the age of 93). 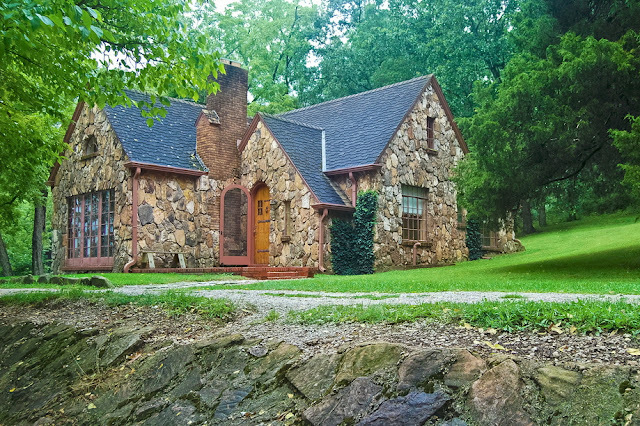 Today, the Laura Ingalls Wilder Home Association owns the Rock House. The house was restored in the 1990's. The house has four bedrooms, two bathrooms, a living room and a dining room. The floors are pecan wood. The Rock House is open for tours, but no interior photos are allowed. I have been through the "rock house" and saw only two bedrooms and one bathroom. There is an upstairs or attic which was not part of the tour. It was a very nice house and no doubt very modern for the time. I lived on that property in 1976. There was a small house I rented that was in between the Wilder home and the rock house. We rented the rock house from some people living in the rock house. I use to go over to the rock house and visit my landlords. Had I known that the house used to belong to the Wilder's at the time I would have paid closer attention. I love history. I never knew the house had been in their family until many years later! I don't get it. Except for the rock, it looks exactly like the Sears catalog house with Sears materials- like the modern "patio doors." Why did the Sears house cost only $1953.00, but Rose spent $11,000 in 1928? That was a TON of money of money, and I read she pretty much lost ALL of her money, and a lot of her parents' money the following year in the Stock Market Crash. Reading books on Rose and Laura, it seems like Rose kicked her parents out of their farm house that Alamanzo built and Rose gave them this rock house, and they weren't very thrilled with it. As soon as Rose moved out of their white farm house, they moved back in. A Mitchell typically cost about $5,000 to $6,000 all inclusive, based on the mortgage amounts we've seen. I'm not sure where the $11,000 figure comes from, but it's possible depending on the cost of the wood used. I live in the Mitchell. Looked just like the catalogue image when I bougt it. It had the bench and shutters to boot. The roof design isn't very practical for Wisconsin weather since the snow builds up behind the chimney. I ended up having a ceiling collapse... then had a roofing company come and reconfigure the space behind the chimney to avoid future leaks. I love my house?? You had the bench?! I've never seen one of those, and they were sold with several of the Sears models. My family lives in a 1928 Sears Mitchell in Flint,Michigan - we love it!